AKRON, OHIO – Carving out a new category of wearable pain relief that actually treats the body, iTENS is the world’s first FDA-cleared, wireless TENS therapy device that works via an iPhone or Android based app. While most wearable medical technologies are used to gather data or biofeedback, the iTENS actually delivers therapeutic stimuli to provide instant, long-lasting and medical-grade pain relief. In addition, the iTENS measures your pain scale, tracks your results, and charts your progress. Transcutaneous Electrical Nerve Stimulation, or “TENS,” has been prescribed by doctors as an effective way to reduce or even eliminate pain for decades. Merging modern technology with the proven results of “TENS therapy,” the iTENS does not require a prescription and offers a natural alternative to pain relief. Non-invasive, non-narcotic, and virtually risk-free, it works by sending tiny electrical signals through the skin to intercept pain signals from reaching the brain. The device also helps stimulate the body to produce higher levels of its own natural painkillers, called endorphins. While TENS devices typically come with a separate unit and wires, iTENS harnesses the power of a smart phone to wirelessly sync with a Bluetooth based electrotherapy device. The phone communicates with the device by sending external signals through gel pads and wings to the nerve. Using a secure, magnetic connection, the laser-printed silver conduction coming from the device is smooth but powerful. In addition, the wing structure is flexible and the water-based gel pads curve with movement, making it so iTENS can be worn without inhibiting activity. An energy efficient, lithium-ion battery provides 24 hours of use on a single charge, and the peel ‘n’ stick gel pads are reusable and replaceable for multiple applications at a very low cost to the user. The iTENS app can control multiple devices at once, and users can choose to treat their pain with optimized settings either by condition or body part. There is also a manual option that allows the device’s frequency, wave and pulse rate to be customized. Small and large wings, along with a long strip accessory are available depending on the treatment needs. The small wings are best for use on ankles, knees, elbows and wrists; the large wings are ideal for the back and shoulders; and the long strip is ideal for the sciatic nerve and tendons. The iTENS is available for purchase online at www.iTENS.com and will be coming soon to select retailers nationwide for an SRP of $99.99. It is covered by insurance with the exception of Medicare. iTENS is a healthcare and technology start-up that creates iPhone and Android device innovations to elevate ones health and manage it outside of the doctor’s office. 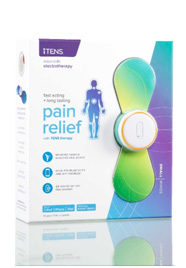 A spin-off from its parent company that has been manufacturing advanced pain management devices for the last 15 years, iTENS’ overarching goal is to ensure its products deliver effective results with cutting-edge appeal and function. Visit www.iTENS.com for more information.